Let the gold rush begin! A third year in a row for this once ‘new kid on the block’ set, that has carved out a following in the Basketball card market. Last year was a somewhat disappointing release, only because the “rookie cards” weren’t live in the set, and we were all dealing with those XRC redemptions. 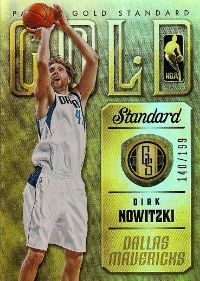 Now Gold Standard returns, and it has all the bells & whistles we are used to, plus some new additions for this season. Base Set – Anytime a base set is numbered (these cards are numbered to 349) it makes them slightly more collectible than they would have been normally. Now you don’t toss these aside, or not think they can’t be traded/sold because a card #/349 is not really a common at all. The cards have a similar look and feel to years past, heavy on the shimmer & shine, with gold. It features 225 cards, where cards #191 – #225 are legends cards. You’ll also find base set variations in this set . (and here from Panini) Panini has an insert set called “Gold Standard” that looks nicer than these cards, and I feel those should have been the base design, but I talk more about that later. Autograph Rookie Cards – Cards #226 – #305 are the auto rookie cards for this year, and they really do look nice. They’ve added a player worn swatch of material for this year. I believe Gold Standard made an appearance in 2011 for Football, and I love how fat the signatures were on those cards … as Panini must have had them use a thicker point pen than usual. This years basketball appear to be the medium or small tip pen. Highlights in this set include the top picks from the last two years, Kyrie Irving and Anthony Davis. You’ll also find NBA playoff darlings Kawhi Leonard, Klay Thompson and Harrison Barnes in the autograph rookie set as well. One interesting thing to note is that these cards are not serial numbered unless it’s a parallel card. It’s (highly) possible there are SP’s within the autograph rookie set, and almost assuredly the top players are in shorter supply than some of the lesser known players. Superscribe Autographs – This set is limited to only 40 players, and includes mostly the games best, with some more random names mixed in like #17 Al-Farouq Aminu, #23 Ersan Ilyasova and #39 Luis Scola. However, there are some big names in the set including autographs from #6 Larry Bird, #12 Bill Russell, #24 Kobe Bryant, #26 Magic Johnson, and even #36 Yao Ming should be highly collected. One reason why Gold Standard costs a bit more than other Panini basketball sets with similar hit configurations is that on-card autographs cost a bit more, but also tend to hold their value better over time with collectors. Gold Standard delivers with big-time on-card autograph content in this set. 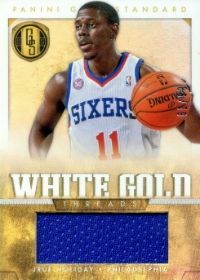 Gold Strike Autographs – Is a slightly deeper checklist than the Superscribe auto’s as you have about 60 total cards, and these are all current NBA players. There are several cards that are #/249 in this set including: #8 Jordan Crawford, #9 Greivis Vasquez, #36 Kawhi Leonard, #47 Kenneth Faried and others. Some of the cards are more limited including #17 DeJuan Blair and #25 Kyrie Irving who are just numbered to 49 copies. Some real nice on-card autograph content again coming from this set, which should make these cards shine a bit on the secondary market as they make there way into the hands of collectors. 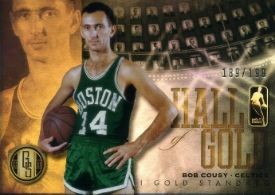 Black & White Gold Memorabilia Cards – The Black Gold memorabilia cards are ones collectors should be familiar with. They feature a larger material pieces that runs vertical along the cards edge, giving you quite a bit more jersey than most standard memorabilia cards. This set features 100 different players, and there are Prime Jersey versions for most players as well. It’s a mix of both current and former NBA players. White Gold threads is a similar set, except the cards look a bit different and most are #/99. It’s an odd mix of young NBA players and some retired ones like Yao Ming, so I’m not sure what Panini was going for with this set – except it does offer you another memorabilia hit. Which in a set filled with top-notch on-card autograph content … isn’t always the best thing. Mother Lode Autographs – WE HIT THE MOTHER LODE!!! You’d think you’d say this if you hit these cards, and in some cases you’re hitting a big hit, but this is basically another really nice on-card autograph set featuring most of the same players that are featured throughout the set. There are some interesting names in this sets checklist however, including: #1 Steve Francis, #13 Micheal Ray Richardson, and #43 Kurt Rambis. All the autograph cards in this set are #/99 or less. In gold mining terms – mother lode means you hit about as big as you can hit – so I’d give these cards extra pop (like adding a piece of real gold) for future seasons to really tie in the sets name. Solid Gold – Here we go, real gold time! These are basically the product hit if you take away the 1/1 or platinum autograph rookie hits. Very unique card, which in years past had a decent amount of gold in it, making them worth something in scrap terms. Of course the collector premium always keeps them above the scrap value, making these highly collectible cards when you can find one for sale. There are only 50 total cards – and I didn’t see one on eBay yet, making these incredibly rare pulls. Gold Rush – The more readily available gold cards in this set are the Gold Rush cards, that feature a familiar gold piece embedded in the card just like a jersey piece would. It’s a large 100 card checklist, with each card being serial #/25 copies. Gold Standard Insert Cards – These cards actually look really nice, and I think they should have used this design on the entire base set. These cards are serial numbered #/199 and they have a Platinum parallel #/10 and a Black parallel #1/1. These cards are almost a mix of contenders and gold standard, and I really like the look. There are 48 total cards in the set. I didn’t see these cards on many promo’s – so maybe they were a late addition to the set. Hall of Gold – Another 48 card set, that appears kind of the blue as they weren’t really promo’d on anything I saw from Panini. These are all NBA Hall of Famers and feature the same parallel cards as the Gold Standard inserts do, with a a Platinum parallel #/10 and a Black parallel #1/1. Marks of Gold – Here is where the autograph content gets a little shaky, as these are sticker autographs that won’t really make to many collectors happy considering all the other sets have some real nice on-card signatures on them. There are some nice players in this set, and most sign enough copies that you should be able to find a card if you need to. It’s a deep 100 card set, but just doesn’t get you as excited as the other autograph sets in Gold Standard do. Metal Cards – a new addition to this years Gold Standard (they were offered in last years as the “rookie cards”) are these metal cards that fall one per box. 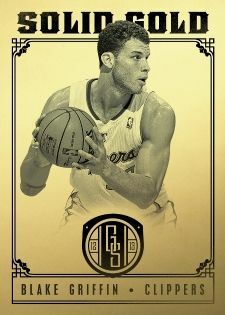 They actually give the collector the feel of a gold bar, that’s really fools-gold … but still a nice card. Plenty were for sale on the secondary market – and with a 90 card checklist, should have some people trying to chase down every single one. The cards have a printing plate feel, just a bit nicer, and despite all the washed out photos on eBay (as these are hard to get a nice scan of) the cards actually do look quite nice in person. Bullion Brand Tags – Some people might prefer these cards over anything else in this set, including the 1/1 Gold Bars. However, these cards are #/2 and there is a rather healthy 100 cards in the set. These are probably some of the most premium laundry tag cards you can pull of these players – so I expect sales to be as good as gold on these cards. Pretty cool set, that should have some stand-out sales on the secondary market once the real gold 1/1 cards start hitting.